For all marketplaces on Envato Market, pricing is determined at the sole discretion of the author of the item, known as author-driven pricing. List price: The price shown to customers on the item page (item price plus buyer fee). Buyer fee: The portion of the list price that represents Envato's fee to the customer (this is a fixed fee in categories with author-driven pricing). Item price: The price paid to the author for the item license. Author fee: The portion of the item price that represents Envato's fee to the author. Uploading a new item on GraphicRiver, ThemeForest, CodeCanyon, 3DOcean, VideoHive and AudioJungle. To upload an item, log into your Envato account and navigate to the upload page (from the main drop-down menu). When uploading a new item on these marketplaces, you need to specify (in whole dollars e.g 10) the Item Price (which is inclusive of the Envato author fee, but exclusive of the Envato buyer fee) in the price field. We then add the Fixed buyer Fee to make the List Price. To work out the amount that you will earn (before tax) based in the Item Price you select, you can use the tool provided via the link How much of this will I earn? on the upload page. 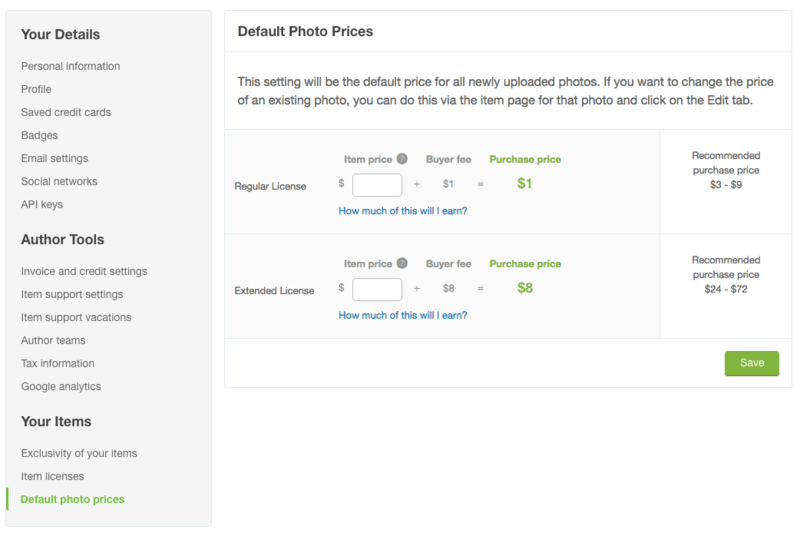 When uploading a new item on PhotoDune you will not need to specify an Item Price. Pricing will be determined by your ‘default’ price which you can set via your Settings page. You will not be able to adjust this during the upload process but you will be able to change the price of any item in your portfolio after upload. If you do not set your default price, your items will be set at a standard price of $5.00 for a regular license or $40.00 for an extended license. Authors may change the price of their items at any time, including temporary price changes promoted as a sale/discount (subject to our Item Promotion Guidelines). If you wish to change the price of an existing item, navigate to the edit item page and specify (in whole dollars e.g 10) the Item Price (which is inclusive of the Envato author fee, but exclusive of the Envato buyer fee) in the price field. We then add the Fixed buyer Fee to make the List Price. Once submitted, price changes will take immediate effect on the item(s). When changing prices as part of a temporary sale/discount, please remember to set your prices responsibly and avoid engaging in any misleading conduct. For supported items in ThemeForest and CodeCanyon, item support will be calculated as a percentage of the item price, regardless of whether the category has author-driven pricing or pricing determined by Envato. You can learn more about item support upgrades, extensions, and renewals here. In Australia, as in many countries, there are strict laws governing pricing conduct. In particular, it’s strictly prohibited to have an agreement, arrangement or understanding between competing businesses (such as two authors) about what price point to sell at. Additionally, there are consumer law protections against misleading/deceptive pricing and discounting practices. Pricing conduct violations that are brought to our attention may result in your account being suspended or permanently disabled. You can learn more about these important pricing issues here. 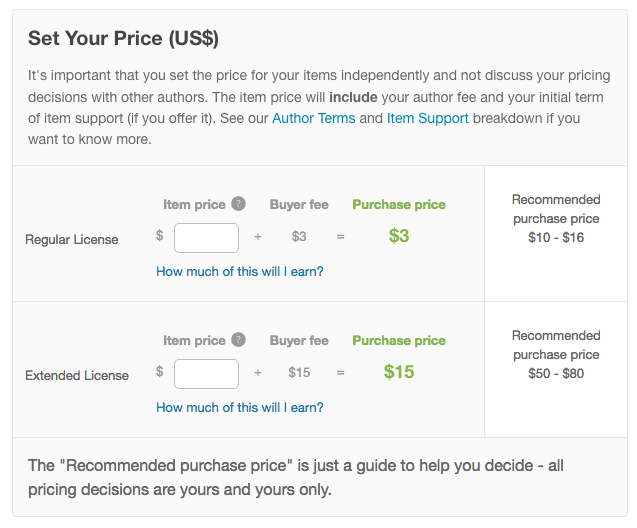 Authors pay Envato an author fee on their item price when it sells. This fee ranges from 55% for non-exclusives, to 12.5-37.5% for exclusives (depending on their total sales volume). With the move to author-driven-pricing, authors are more in control of their total earnings from a sale. For example, consider an author selling a Photoshop add-on. Envato’s fixed buyer fee for this category is $1. The remainder of the total list price is the author’s item price, on which we’ll charge an author fee. Let’s assume the author is an exclusive author who has made it to the lowest fee (12.5%). Author sets the item price at $1, it'll be listed at $2, author earnings will be 87.5% x $1 = $0.88 (or you can think of it as 43.75% of the total list price). Author sets the item price at $4, it'll be listed at $5, author earnings will be 87.5% x $4 = $3.50 (or you can think of it as 70% of the total list price). Author sets the item price at $9, it'll be listed at $10, author earnings will be 87.5% x $9 = $7.88 (or you can think of it as 78% of the total list price). Author sets the item price at $19, it'll be listed at $20, author earnings will be 87.5% x $19 = $16.63 (or you can think of it as 83% of the total list price).